WASHINGTON — U.S. regulators charged Volkswagen and former CEO Martin Winterkorn with defrauding investors during its massive diesel emissions scandal. The charges from the U.S. Securities and Exchange Commission come two years after the German automaker settled with the U.S. over criminal and civil charges, as the company tries to distance itself from one if its darkest eras. The SEC said that between April 2014 and May 2015, Volkswagen issued more than $13 billion in bonds and asset-backed securities in U.S. markets when senior executives knew that more than 500,000 vehicles in the country grossly exceeded legal vehicle emissions limits. Volkswagen made false and misleading statements to investors and underwriters about vehicle quality, environmental compliance, and the company's financial standing, which gave Volkswagen a financial benefit when it issued securities at more attractive rates for the company, according to the SEC. "Volkswagen hid its decade-long emissions scheme while it was selling billions of dollars of its bonds to investors at inflated prices," said Stephanie Avakian, co-director of the SEC's enforcement division. In September 2015 Volkswagen installed software on more than 475,000 cars that enabled them to cheat on emissions tests, according to the Environmental Protection Agency. The software reduced nitrogen oxide emissions when the cars were placed on a test machine but allowed higher emissions and improved engine performance during normal driving. In 2016 the Justice Department sued Volkswagen over the emissions-cheating software and the Federal Trade Commission sued the company, saying it made false claims in commercials promoting its "Clean Diesel" vehicles as environmentally friendly. Winterkorn resigned saying he took responsibility for the fraud, but insisted he personally did nothing wrong. 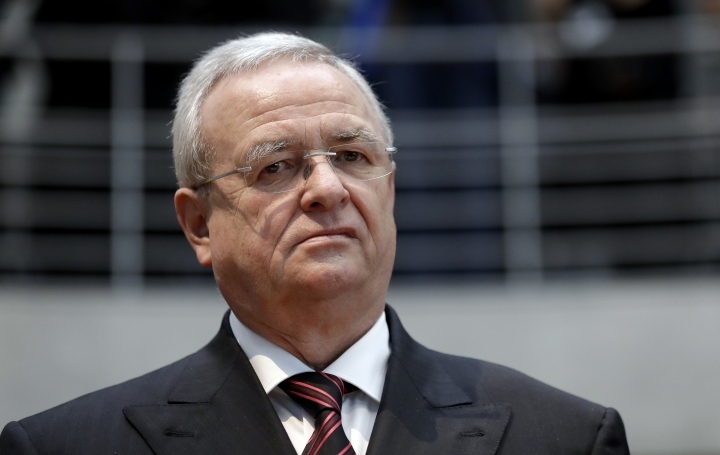 Volkswagen said Friday that the SEC is simply repeating unproven claims about Winterkorn. "Regrettably, more than two years after Volkswagen entered into landmark, multibillion-dollar settlements in the United States with the Department of Justice, almost every state and nearly 600,000 consumers, the SEC is now piling on to try to extract more from the company," the company said in a prepared release. The company has paid some $20 billion in fines and civil settlements. It has also pleaded guilty to criminal charges in the United States and several managers, including Winterkorn, were charged there. The surprise charges from the SEC arrive as the German company attempts to distance itself from the scandal. On Tuesday the automaker said that it planned to ramp up production of electric vehicles over the next ten years, to 22 million, and reduce its carbon footprint over vehicle life cycles by 30 percent. Volkswagen's pivot to electric vehicles comes as it seeks to comply with new limits on carbon dioxide emissions in Europe, and a push by China for more low-emission vehicles. The SEC's complaint, filed in the U.S. District Court for the Northern District of California, charges Volkswagen AG, its subsidiaries Volkswagen Group of America Finance, LLC and VW Credit, Inc., and Winterkorn with violating the antifraud provisions of the federal securities laws. The SEC seeks permanent injunctions, disgorgement of ill-gotten gains with prejudgment interest and civil penalties. It also wants to bar Winterkorn from holding any corporate officer or director positions.